Rooster River flooded its banks during Tuesday’s torrential storm. 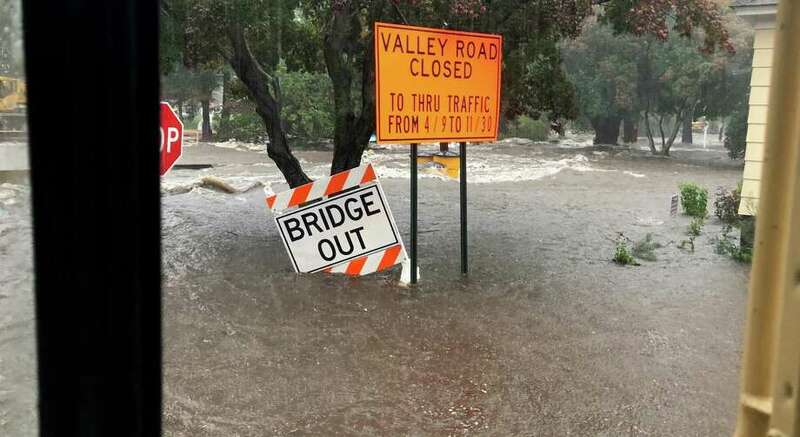 FAIRFIELD — The alerts came twice Tuesday afternoon from the National Weather Service, warning of possible flash flooding. No one expected, however, that the town would get at least five inches of rain in two hours. The heavy downpours pushed storm drains past their limits, and sent rivers over their banks. Motorists found themselves stranded and being rescued by police and firefighters, and their cars towed. With things a bit drier on Wednesday, the town sent out teams to the hardest-hit areas, according to First Selectman Mike Tetreau. “We had 36 cars towed, and about 30 to 40 people rescued, some of them in actively moving waters,” Police Lt. Robert Kalamaras said. “There were several calls where the car was floating,” including one on Park Avenue that was in water 10 feet deep. Kalamaras said most of the water had receded by 9 p.m. Tuesday. The Police Department itself did not escape unscathed. Five police vehicles, used by the School Safety Unit that works out of the Board of Education offices on Kings Highway, were lost to the flood waters. Deputy Chief Chris Lyddy said they don’t know yet whether the loss will be covered by insurance. Public Works Director Joseph Michelangelo said the flooding was a combination of both local streams leaving their banks and storm drains not being able to keep up with the deluge. “Our Public Works crews are driving every one of our town roads today,” Michelangelo said Wednesday. They will be doing a general cleanup of debris, which is mostly gravel, sand, and branches, and full road sweeping of the worst sections. They will also be filling and restoring areas along roads where gulleys and washouts developed, clearing culvert inlets and outlets and catch basin tops, and inspecting bridges for signs of erosion or scouring to footings and abutments. During the height of the storm, the police blotter showed calls reporting flooding from 37 different streets. That doesn’t include calls for assistance or hazardous conditions. Fire Lt. Robert Smith said many residents had basements flooded up to the first floor, with homes in the Lnnbrook Road and Lewis Drive area probably hit the hardest, where the Rooster River went over its banks. “Many homes were damaged due to quick rising waters,” Smith said. While residents found themselves pumping out flooded basements, the Fairfield Garden Club sent out an alert about its beehives. The hives, kept at Oak Lawn Cemetery and Arboretum, near to the Ogden House, were swept away in the torrential rains and flooding. They’re asking anyone who finds the hives, or parts of the hives, in their yards to let them know. Last year, the club harvested 400 jars of honey from the hives. Oaklawn has said they will find a higher location for the new hives. Kalamaras said the task force of health, fire and police employees will be assessing the most heavily impacted areas, and determine if any hazards remain. Anyone looking for their towed cars can call 203-254-4800.